Reserve Bank of India allows Pune-based Rupee Co-operative Bank to continue giving its services with restrictions for three more months till August 2018. RBI had first charge restrictions from February 22, 2013, to August 21, 2013, and extended it on eight occasions till May 2018. Rupee Co-Operative Bank headquarter in Pune, Maharashtra and it has 40 offices/branches. On 29th May 2018, India signed an Agreement for IBRD Credit of USD 21.7 Million for the Strengthening of Public Financial Management in Rajasthan Project in New Delhi. The total Project is around USD 31 million, of which USD 21.7 million will be capitalize by the World Bank, and rest will be funded-out of the State Budget. Duration of the Project is 5 years. The objective is to contribute to upgrade Budget execution, boost accountability and greater efficiency in Revenue Administration in Rajasthan which involves Strengthening of the Public Financial Management Framework, Expenditure and Revenue Systems and Project Management and Capacity Building among others. On 31st May 2018, India signed a USD 500 million (Rs 3,371 crore) loan agreement with World Bank to provide additional financing for PMGSY rural road projects for a 3-year grace period, and a maturity of 10 years. The additional financing will also fill the gender gap by creating employment opportunities for women in construction and maintenance. The World Bank has supported PMGSY since its setting up, in 2004. So far it has invested over $1.8 billion in loans and credits for North India – Bihar, Himachal Pradesh, Jharkhand, Meghalaya, Rajasthan, Uttarakhand, and Uttar Pradesh (mostly in the economically weaker). On 31st May 2018, Asian Development Bank (ADB) will provide USD 375 million loan for a project to improve irrigation in Madhya Pradesh for expanding irrigation networks and system efficiency, helping boost farmers’ income. The total cost is USD 535.1 million, of which the govt. will provide USD 160.71. It will also help farmers raise micro-irrigated agriculture including high-value crops and double farmer incomes. On 30th may 2018, State Bank of India has hiked the interest rates on fixed term deposits by 10 to 25 basis points for selected tenure. The new rate effective from May 28, on retail deposits below Rs 1 crore, deposits for 1 year to 2 years will now accrue 6.65 per cent. for the senior citizens, the new rate is 7.15 per cent from 6.90 per cent earlier. There is no change in interest rate for deposits less than one year, Currently, the banks give 5.75 per cent for deposits under 7 days to 45 days’ scheme. On 2nd June 2018, India's major banks SBI, PNB and ICICI Bank raised their benchmark lending rates or MCLR by up to 0.1 per cent, making loans costlier. SBI has increased the lending rate by 10 basis points for three years. Marginal Cost of Funds Based Lending Rate (MCLR) stands at 7.9 per cent, for 3-year tenor increased to 8.45 per cent. PNB raised the MCLR for 3 years and 5 year tenors to 8.55 per cent and 8.7 per cent, also increased the base rate to 9.25 per cent. ICICI Bank raised 1 year MCLR by 10 bps to 8.40 per cent. 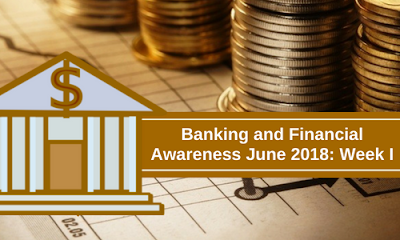 Financial Literacy Week beginning on June 4 to June 8, theme for this year has been chosen by RBI as customer protection. On this event the main focus on creating awareness among customers of banks about financial products and services available for them, and encourage them to go digital. Also focus on four consumer protection messages like Good practices for a safe digital banking experience, ‘know your liability’ for unauthorised electronic banking transaction and. Resolution of complaint received within period of 90 days from the date of receipt of the complaint. awareness about Banking Ombudsman scheme also emphasized.